Video of Dunlin (Calidris alpina) foraging in the sand at Crescent Beach in Surrey, British Columbia, Canada. 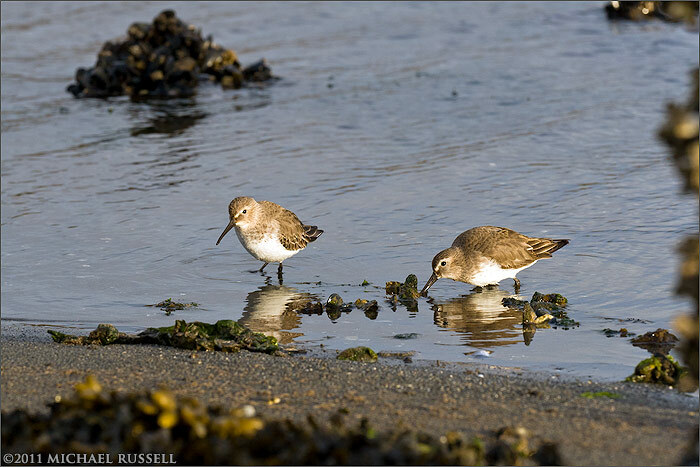 I photographed these Dunlin (Calidris alpina), or at least I think that is the right species ID, back on New Years Day at Crescent Beach, Surrey, BC. I don’t shoot a lot of video, but in this case I thought it would show the frenetic activity on the beach as they foraged. The Dunlin here are most likely feeding on the biofilm and small invertebrates in the intertidal zone. These birds just almost never sit still – seemingly always moving, running, or flying as a group. The video looks like it might be sped up (it isn’t) but watch the Seagull, who hasn’t had the stimulants the Dunlin appear to have consumed. This species only stays here in estuary during the winter, and has usually moved on to breeding grounds by spring. I have thought about purchasing a small microphone to record audio along with the video as the internal microphone on my Canon 7D isn’t that great and likes to pick up all sorts of extra noise. That probably wouldn’t have helped me in this case, as someone behind me on the path was loudly complaining about their coffee maker. This video has no sound as a result, and is better off for it. This is something I have learned the hard way. While I am not going to bring the SLR when I go to the grocery store, I have learned to bring it with me if there even a decent chance of finding something interesting to photograph. There have been many times when I have found something interesting – and every time this happens my camera has done me little good sitting in its bag back home. This can be a bitter pill to swallow when one comes across something spectacular. A few days ago I accompanied a friend on a journey to Washington State to buy a new vehicle. I debated whether I should bring the camera bag or not. It was quite likely that I would not have time to shoot anything – and also quite likely I would see nothing to shoot. I’ve had this debate before – and opted to not bring my equipment with me. Frequently this has worked out just fine, but other times I have missed great opportunities by leaving my equipment at home. So this time I brought it all with me. We stopped for a quick break along SR20 in San de Fuca which is just outside of Oak Harbor on Whidbey Island. 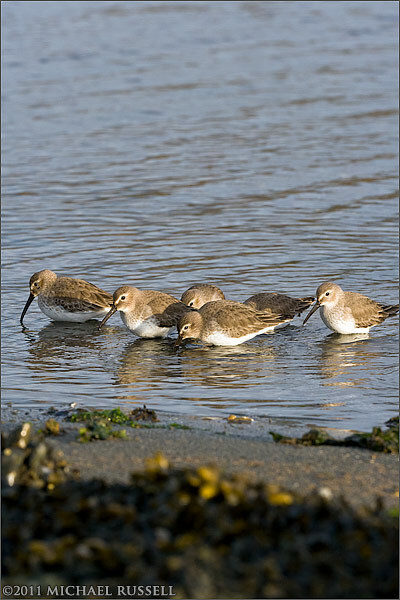 Walked down to the shore and there was a small flock of Dunlin (Calidris alpina) foraging along the shore. A quick dash back to the car and I began stalking them along the shore. Not very skittish at all, but they did move along the shore away from me when I approached. I had to hide behind old timbers of a dock to get as close as possible. Normally it is much better to sit and wait for a group like this to wander back towards you, but they did not seem alarmed by my presence and I had no time to camp out. 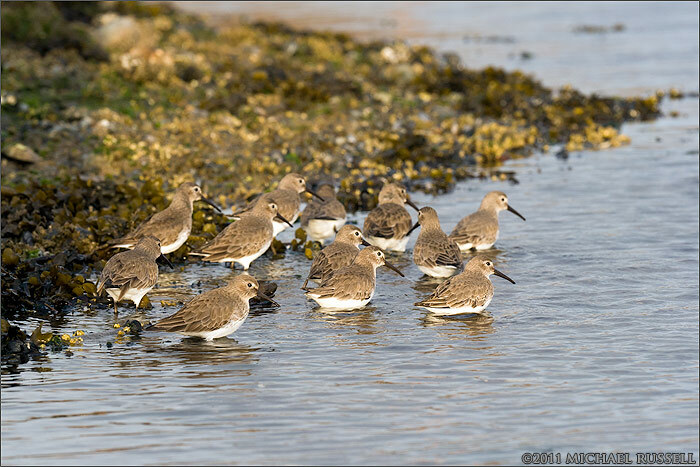 Dunlin spend their time here on the coasts of Washington State and British Columbia in the winter – fattening themselves up before a migration to their summer breeding grounds in Alaska and along the shores of Hudson Bay.